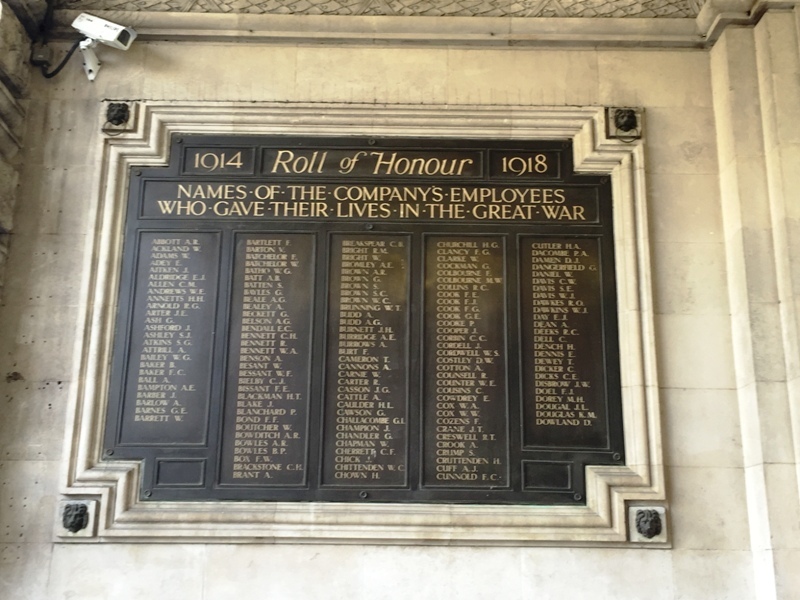 Within the confines of Waterloo Station are four large rolls of honour, each taking up a wall. 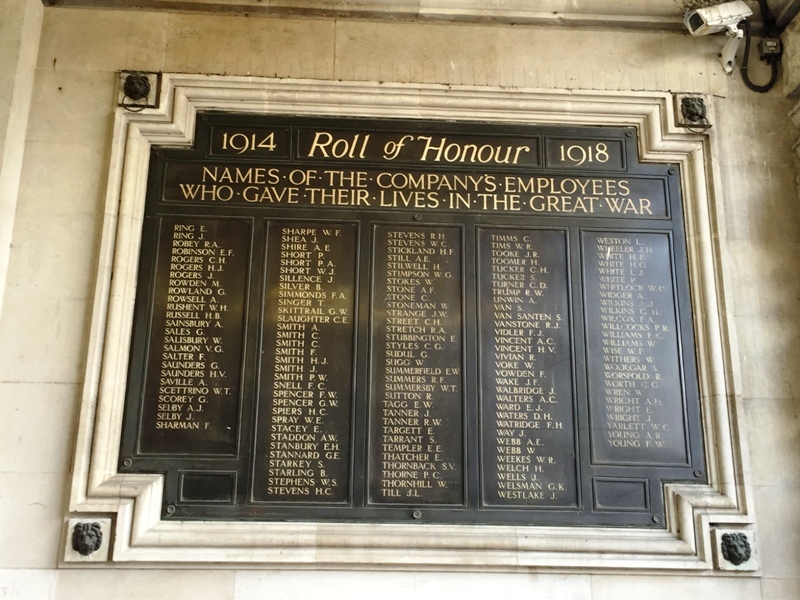 These contain the names of the men who died during World War 1 who worked for the London and South Western Railway Company. In all there are ten columns of names. 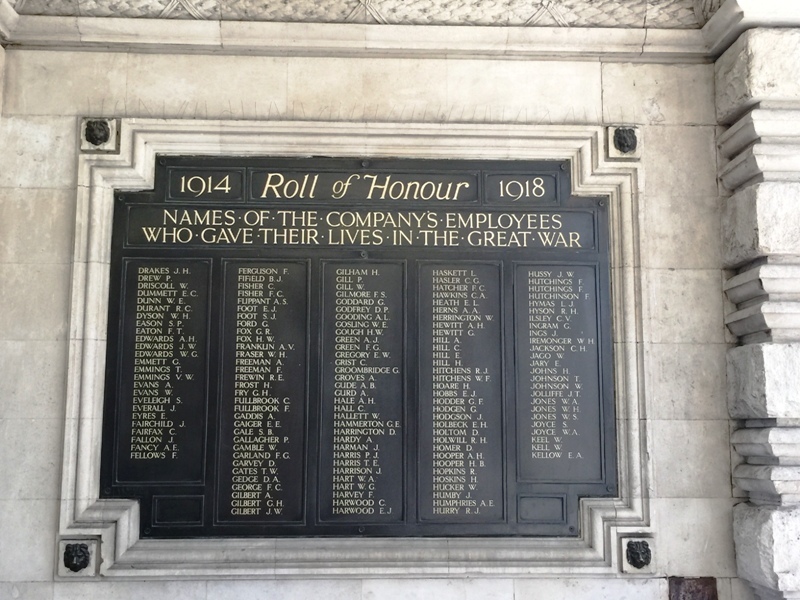 Details here are taken from these rolls of honour and from the St Paul's Cathedral Service In Memory of Railwaymen who died in service of their Country 1914-1918. 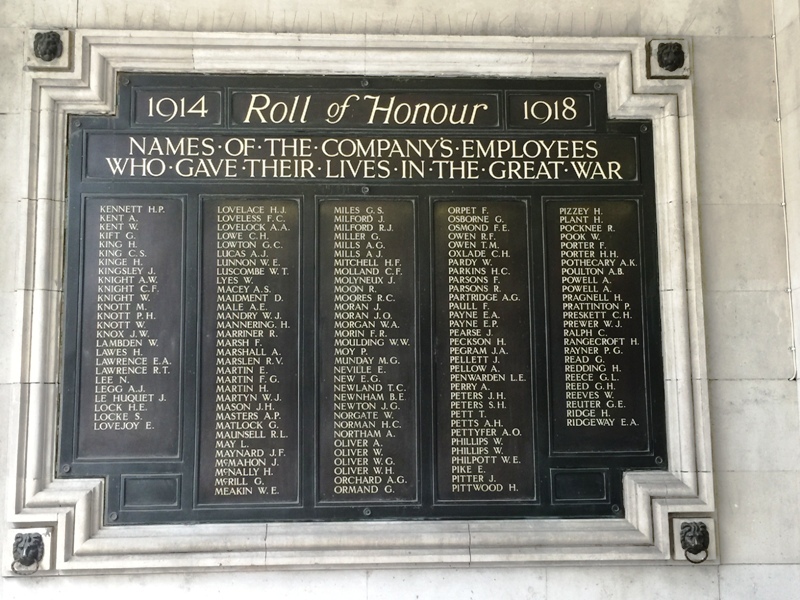 In all there are 527 names here and as they have come from various towns along the railway it is extremely hard to research the names as there is no baseline of information to draw from. The L&SWR began as a railway to link Southampton and London, but in due course it expanded much further into the West of England until it reached as far afield as Exeter, Plymouth, Ilfracombe, Bude and Padstow. In the course of this expansion it acquired or leased many other smaller railway companies. To see details of the stations and branch lines covered see the RailWest web site. Private 6779, 2nd Battalion, Bedfordshire Regiment. Killed in action 2 July 1916. Aged 34. Born and resident Wolverton, Buckinghamshire, enlisted London. Son of Joseph and Kate Abbott, of 32, Cambridge St., Wolverton, Bucks. Baptised 19 March 1882 in St George, Wolverton, Buckinghamshire, son of Joseph and Kate Allen Elizabeth Abbott, resident Wolverton, Buckinghamshire. Employed as Brake Fitter in the Carriage and Wagon Department at Eastleigh Station. Buried in CERISY-GAILLY MILITARY CEMETERY, Somme, France. Plot II. Row M. Grave 6. Private 5254, 2nd Battalion, Devonshire Regiment. Died 24 January 1918. Aged 37. Son of William Ackland, of Knowle, Braunton, Devon, and the late Eliza Ackland; husband of Gertrude Ellen (nee Fewins) Ackland, of 104, East John St., Newtown, Exeter, married St. Matthew, Exeter, 18 October 1905, four sons. In the 1891 census he was aged 10, born Devon, a scholar, son of William Ackland (a widower), resident Knowl, Braunton, Barnstaple, Devon. In the 1911 census he was aged 29, born Braunton, a Farm Labourer, married to gertrude with two sons, resident Knowle Braunton Devon, Braunton, Devon. Employed as Coalman. Discharged from military service 2 September 1915 at Exeter under King's Regulations Paragraph 392 (xvi), wounded in the spine by a shell 9 May 1915, suffered paraplegia, no longer physically fit for service. Re-enlisted 6 May 1911 for 4 years as a Reservist. Originally attested 16 December 1898, aged 18, a Farm Labourer, resident Braunton, Barnstaple, Devon, height 5 feet 4½ inches, weigth 121 lbs, chest 34 inches. fresh complexion, blue eyes, fair hair, religious denomination Church of England, discharged at termination of period of servide 15 December 1910. Issued Silver badge no. 43125 22 January 1917. Buried in EXETER HIGHER CEMETERY, Devon. Grave 165. Second Corporal WR/263605, Railway Operating Division, Royal Engineers. Died in Italy 8 November 1918. (D.G.T.). Aged 21. Born and enlisted Kingston-On-Thames, Surrey. Only son of Mrs. A. J. Adams, of 2, Ashdown Rd., Kingston-on-Thames. In the 1901 census he was aged 3, born Kingston-on-Thames, Surrey, son of William and Ada Adams, resident 2, Ashdown Road, Kingston on Thames, Kingston, Surrey. Employed as Clerk in Traffic Department, Superintendent of Lines Office. Buried in ARQUATA SCRIVIA COMMUNAL CEMETERY EXTENSION, Italy. Plot I. Row F. Grave 7. Rifleman 6061, 1st Battalion, Rifle Brigade (The Prince Consort's Own), formerly Private 8337, 12th (Prince of Wales's Royal) Lancers. Died of wounds 16 June 1917. Born and resident Clewer, Berkshire, enlisted Reading. Employed as Platelayer in Engineers Department at Datchet. Baptised 2 April 1893 in Clewer, Berkshire, son of William Benjamin and Edith Harriet Adey. In the 1901 census he was aged 9, born Clewer, Berkshire, a scholar, son of William and Edith Adey, resident Cottages, 2, Clewer New Town, Clewer Without, Windsor, Berkshire. In the 1911 census he was aged 18, a Farm Labourer, born Clewer, berkshire, son of William B and Edith Adey, resident 1, Adeys Cottages, Clewer New Town, Clewer, Clewer Within, Berkshire. Buried in ST. NICOLAS BRITISH CEMETERY, Pas de Calais, France. Plot II. Row A. Grave 5. Gunner. Employed as Engine Cleaner in Locomotive Department at Dorchester. Private 1193, 2nd Battalion, East ASurrey Regiment. Killed in action 25 April 1915. Aged 20. Son of Alfred and Mary Elizabeth Aldridge, of 17, Skelbrook St., Earlsfield, London. Baptised 7 April 1895 in Byfleet, Surrey, son of Alfred and Mary Elizabeth Aldridge. Employed as Messenger in the Traffic Department, Waterloo. Born Byflect, Surrey, enlisted Wandsworth, Surrey. In the 1901 census he was aged 6, born Byfleet, Surrey, son of Alfred and Elizabeth Aldridge, resident 18, Coliston Road, Wandsworth, London & Surrey. No known grave. Commemorated on YPRES (MENIN GATE) MEMORIAL, West-Vlaanderen, Belgium. Panel 34. Rifleman 331081 [331981 on SDGW], 1st/8th (T.F.) Battalion, Hampshire Regiment formerly 2786, Hampshire Regiment. Killed in action in Palestine 2 November 1917. Aged 21. Born and resident Poole, Dorset, enlisted Ringwood, Hampshire. Birth registered in the October to December Quarter 1896 in Poole Registration District, Dorset; mother's maiden name Phillips. Son of Mr. S. F. and Mrs. F. Allen, of 14, Heckford Rd., Longfleet, Poole, Dorset. In the 1911 census he was aged 14, born Poole, Dorset, an Errand Boy for an Upholsters, son of Samuel and Fanny Allen, resident 14, Hickford Road, Poole, Dorset. Employed as Porter in Traffic Department at Ringwood. No known grave. Commemorated on JERUSALEM MEMORIAL, Israel and Palestine (including Gaza). Panels 26 to 29. Gunner 138098, 26th Siege Battery, Royal Garrison Artillery formerly 1910, hampshire, Royal Garrison Artillery. Died of bronchial pneumonia at 12 General Hospital, Rouen 4 November 1918. Aged 27. Husband of Frances Eva Andrews, of 3, Lime Avenue, Middle Rd., Sholing, Southampton. Born Leckford, Hampshire, enlisted Southampton 4 November 1915, aged 25 years 11 months, a Labourer, height 5 feet 9¾ inches, chest 33½ inches. In the 1891 census he was aged under 1 year, born Hampshire, son of Benjamin and Sarah Andrews, resident High Street, Leckford, Stockbridge, Hampshire. In the 1901 census he was aged 10, born Leckford, Hampshire, son of Benjamin Andrews (a widower), resident Longstock, Stockbridge, Hampshire. In the 1911 census he was aged 20, born leckford, Hampshire, a Domestic gardener, baording at Post Office, Leckford, Stockbridge, Hampshire. Employed as Labourer at Locomotive Department, Eastleigh. Buried in ST. SEVER CEMETERY EXTENSION, ROUEN, Seine-Maritime, France. Section S. Plot III. Row H. Grave 2. Lance Corporal 7791, 2nd Battalion, Hampshire Regiment. Killed in action 3rd September 1916 in France & Flanders. Aged 27. Born Salsibury, Wiltshire, enlisted Winchester, Hampshire, resident Eastleigh, Hampshire. Son of John and Sarah Ann Annetts, of 66, Kingston Deverill, Bath. Native of Horton Heath, Eastleigh, Hants. In the 1911 census he was aged 22, born Salsibury, Wiltshire, with the military overseas, in Lyonberg, Cape of Good Hope, unmarried, 2nd Battalion, Hampshire Regiment. In the 1901 census he was aged 11, born Wiltshire. son of John and Sarah Annetts, resident Sandy Lane, Lake, Stoke Park, Winchester, Hampshire. Winchester, Hampshire. Orignally enlisted 20 September 1906 at Eastleigh, aged 17 years 10 months, as Private 1637, 'K' Company, 3td Battalion, Hampshire Regiment, born Swallowcliffe, Salsibury, Hampshire, resident Horton Heath, Eastelight, Hampshiree, civil occupation Market Gardener, height 5 feet 23/8 inches, weight 104 lbs, chest 32 inches, fresh complexion, blue eyes, brown hair, religious denomination Church of England. Transferred to main Hampshire Regiment 13 June 1907. Son of John Annetts of Hamley Farm, Hortonheath, Eastleigh, Hampshire, brother of Arthur, Thomas, William, Ivy, Edward, and Albert . Employed as a Labourer in the Locomotive Department at Eastleigh. Buried in LONSDALE CEMETERY, AUTHUILE, Somme, France. Plot V. Row L. Grave 5. Private 29217, No. 1 Company, 2nd Battalion, Grenadier Guards. Killed in action 27 August 1918. Aged 20. Born Kingston, Hampshire, 29 April 1898, enlisted Portsmouth. Son of William Edmund and Beatrice Sophia Arnold, of 61, Newcome Rd., Fratton, Portsmouth. Baptised Southsea, St Bartholomew, Hampshire. 12 June 1898, son of Willie Edmund and Beatrice Sophia Arnold, resident Hampton Lodge, Tabot Road, Southsea. In the 1901 census he was aged 2, born Portm,south, Hampshire, son of Willie and Beatrice Arnold, resident 61, Newcome Road, Portsmouth, Hampshire. In the 1911 census he was aged 13, born Southsea, Portsmouth, a school boy, son of Willie Edmond and Beatrice Sophia Arbold, resident 61, Newcome Road, Kingston, Portsmouth, Hampshire. Employed as Engine Cleaner at the Locomotive Department at Fratton. Buried in MORY ABBEY MILITARY CEMETERY, MORY, Pas de Calais, France. Plot V. Row D. Grave 16. [Listed as ATTER in St Paul’s Cathedral Service Book] Private G/8701, 7th Battalion, East Surrey Regiment. Killed in action 13 August 1916. Born Wimbledon, Surrey, enlisted London. Husband of Ellen Elizabeth aka Nellie (nee Mist) Arter, of 28, Marsh farm Road, Twickenham, married in January to March Quarter 1915 in Brentford Registration District, Middlesex. Son of Ann Arter, of 1, Cowdrey Road, Wimbledon. London S.W. 19. Employed as Carriage Cleaner in Traffic Department at Twickenham. In the 1901 census he was aged 15, born Wimbledon, Surrey, an Errand Boy at a Printing Works, son of John and Anne Arter, resident 24, Tennyson Road, Wimbledon, Kingston, Surrey. In the 1911 census he was aged 24, born Wimbledon, Surrey, with the military overseas in Bhamo, Private 2nd Battalion, East Surrey Regiment. Enlisted 1906 Kingston-Upon-Thames, aged 20 years 2 months, a Carman by trade, unmarried, height 5 feet 7 inches, weight 133 lbs, chest 36 inches, fresh complexion, blue eyes, fair hair. Suffered Malaria 13 to 26 February 1910. Post Malarial debility 21 to 25 March 1910. Embarked France 17 March 1916, to Unit 29 March 1916, missing 13 August 1916. No known grave. 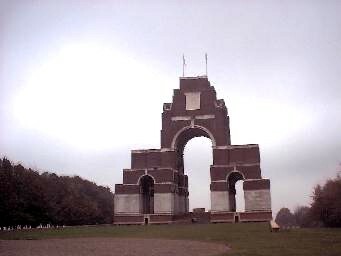 Commemorated on THIEPVAL MEMORIAL, Somme, France. Pier and Face 6 B and 6 C.
Private 204103, 8th Battalion, East Surrey Regiment. Missing presumed killed in action 12 October 1917. Aged 21. Born Lambeth, Surrey. Son of Minnie Ash and the late George Ash, of 3, Prospect Crescent, Whitton, Twickenham; Middlesex. In the 1911 census he was aged 13, born South Lambeth, a scholar, son of George and Minnie Emma Ash, resident 7 Prospect Crescent, Twickenham, Middlesex. Employed as Porter in Traffic Department at Twickenham. Enlisted Twickenham, Middlesex 26 November 1916, aged 18 years 210 days, civil occupation Porter L.W.R., height 5 feet 8½ inches, weight 140lbs, chest 32 inches. No known grave. Commemorated on TYNE COT MEMORIAL, West-Vlaanderen, Belgium. Panel 79 to 80. Private 7058, 1st Battalion, Prince Albert's (Somerset Light Infantry). Died of wounds 20 December 1914. Aged 30. Born Sherborne, Dorset, resident Hindon, Wiltshire, enlisted Cardiff. Son of Frederick and Elizabeth Ashford, of Purse Caundle, Sherborne, Dorset; husband of Gaina Agneta W. Fowler (formerly Ashford, nee Henry), of 110, Junction Rd., Andover, Hants, married in the July to September Quarter 1908 in Andover Registration District, Hampshire. Railway employee (porter and R. guard). In the 1911 census he was aged 26, born Pense Caundle, Dorset, a Porter, married to Gaina (nee Hindy), with one son, resident Limbury Villas, the Laurels, Junction Road, Andover, Hampshire. Employed as Porter & Relief Guard in Traffic Department at Andover Junction. Buried in BAILLEUL COMMUNAL CEMETERY, NORD, Nord, France. Row E. Grave 10. Private 245484, 1st/2nd (City of London) Battalion (Royal Fusiliers), London Regiment formerlyu 684153, 22nd Battalion, London Regiment. Killed in action 28 March 1918. Born, resident and enlisted Battersea. In the 1911 census he was aged 23, born Battersea, London, a Porter, son of Alice Ann Ashley (a widow), resident 6 Maysoule Road, Plough Road, Battersea, London & Surrey. In the 1901 census he was aged 13, born Battersea, Middlesex, an inmate at 29, Guildford Road, Lambeth, London & Surrey. Employed as Carriage Cleaner in Traffic Department at Waterloo. No known grave. Commemorated on ARRAS MEMORIAL, Pas de Calais, France. Bay 9. Pioneer 46261, 86th Field Company, Royal Engineers. Died of wounds at Gallipoli 24 August 1915. Aged 21. Born and enlisted Bournemouth. Son of Mr. F. W. and Mrs. E. B. Atkins, of 6 Clarendon Rd., Christchurch, Hampshire. In the 1911 census he was aged 17, born Bournemouth, Hampshire, a Gardener, son of Frederick William and Emily Blanche Atkins, resident 6 Clarendon Road Christchurch, Christchurch, Hampshire & Dorset. Employed as Engine Cleaner in Locomotive Department at Bournemouth. No known grave. Commemorated on HELLES MEMORIAL, Turkey (including Gallipoli). Panel 24 to 26 or 325 to 328. [Listed as Private.] Corporal 330018, 1st/8th (T.F.) Battalion, Hampshire Regiment. Killed in action in Palestine 19 April 1917. Aged 29. Born and resident Whitwell, Isle of Wight. Son of R. L. Attrill, of Berryl Farm, Whitwell, Ventnor, Isle of Wight. Baptised 22 January 1888 in Whitwell, Hampshire, son of Robert Leonard and Alice Atrill. In the 1901 census he was aged 13, born Whitwell, Isle of Wight, son of Robert L Attrill (a widower), resident Berryl Cottages, Godshill, Isle of Wight, Isle of Wight & Hampshire. In the 1911 census he was aged 23, born Godshill, a Caroenter, son of Robert Leonard Attrill (a widower), resident Berryl Farm near Whitwell, Godshill, Isle of Wight & Hampshire. Employed as Labourer in Engineers Department at Ryde. Buried in GAZA WAR CEMETERY, Israel and Palestine (including Gaza). Plot Xxi. Row G. Grave 8. Private 204079, 1st/4th (T.F.) Battalion, Hampshire Regiment. Killed in action in Mesopotamia 24 February 1917. Aged 20. Born Leatherhead, Surrey, enlisted Southampton. Son of John and Annie Bailey, of 37, Northumberland Rd., Southampton. In the 1911 census he was aged 14, born leatherhead, Surrey, son of John and Annie Bailey, resident 366, Priory Road, St Denys, Southampton, Portswood, Hampshire. Employed as Porter in Goods Department at Southampton. No known grave. Commemorated on BASRA MEMORIAL, Iraq. Panel 21 and 63. Private 15114, 2nd Battalion, Grenadier Guards. Killed in action 2 August 1915. Aged 21. Born and enlisted Hounslow, Middlesex. Employed as Labourer in Engineers Department at Clapham Junction. Birth registered in the April to June Quarter 1894 in the Brentford Registration District, Middlesex; mother's maiden name 'Heath'. Son of Minnie E. Baker, of 31, Belgrave Rd., Hounslow, and the late B. Baker. In the 1901 census he was aged 7, born Hounslow, Middlesex, son of Benjamin and Minnie Baker, resident 3, Wellington Road Castle Place, Heston, Brentford, Middlesex. In the 1911 census he was aged 18, born Hounslow, Middlesex, Private, Grenadier Guards, resident Barracks, Caterham, Surrey. Buried in GUARDS CEMETERY, WINDY CORNER, CUINCHY, Pas de Calais, France. Plot I. Row A. Grave 4. [Not listed in St Paul’s Cathedral Service Book]. Employed as Labourer in the Engineers Department, Eastleigh Hampshire. Birth registered in the July to September Quarter 1892 in the Wareham Resistration District, Dorset; mother's maiden name 'Bartlett'. In the 1911 census he was aged 18, born Wareham, Dorset, a Plumber's Assistant, son of Samuel Deaker and Victoria Baker, resident 5, Weston Road, Eastleigh, Hampshire. Joined the Amalgamated Society of Railway Servants at Eastleigh 28 March 1912. [Listed in Railway documents as 3rd Battalion] Private 241838, 2nd/5th (T.F.) Battalion, Hampshire Regiment. Died on service in Egypt 25 October 1917. Aged 29. Born Portsmouth, resident Ryde, Isle of Wight, enlisted Newport, Isle of Wight. Husband of Emma L. (nee King) Ball, of Myrtle Cottage, Bettesworth Rd., Ryde, Isle of Wight, married January to March Quarter 1916 in the Siel of Wight Registration District, Hampshire. In the 1911 census he was aged 23, born Portsmouth, Hampshire, a Blacksmith's Striker, son of Henry and Annie Ball, resident 30, Surrey Street, Ryde, Isle of Wight & Hampshire. Employed as Striker in Engineers Department at Ryde. A member of the National Union of Railwaymen as a Smith's Mate in the Ryde, Isle of Wight, Hampshire, branch, joined 27 November 1915. Buried in DEIR EL BELAH WAR CEMETERY, Israel and Palestine (including Gaza). Section D. Grave 59. Able Seaman 198232, H.M.S. Viknor, Royal Navy. Killed or died by means other than disease, accident or enemy action 13 January 1915. Born Hampstead, London 1882. HSon of George Bampton. Husband of Clara Rose (nee Luxton) Bampton, of 24 Lennox Bldge, Wandsworth Road, London. S.W., married 6 April 1909 in Ilfracombe, Devon. Employed as Brigade Fireman in the Engineers Department at Nine Elms. Member of National Union of Railwaymen, joined Nine Elms 2 Branch 19 July 1914 as a Brigade Fireman, Railway Workers. No known grave. Commemorated on PORTSMOUTH NAVAL MEMORIAL, Hampshire. Panel 7. Corporal. Employed as Labourer in Docks and Marine Department at Southampton. Private 23031, 5th Battalion, Duke of Edinburgh's (Wiltshire Regiment). Died of wounds in Mesopotamia 20 February 1917. Aged 21. Born Eastleigh, Hampshire, resident Sutton, Surrey, enlisted Winchester. Brother of Mr. G. W. Barlow, of 12, Vale Rd., Sutton, Surrey. In the 1911 census he was aged 15, an Apprentice Coach Trimmer, born Eastleigh, Hampshire, son of george Barlow (a widower - Budget Trimmer L S W), resident 78, Desborough Road, Eastleigh, Hampshire. Employed as Apprentice in Carriage and Wagon Department at Eastleigh. Buried in AMARA WAR CEMETERY, Iraq. Plot XXVI. Row B. Grave 8. Trooper 2151, 2 Corps, Household Battalion. Presumed killed in action on or since 11 May 1917. Born Richmond. Next of kin his mother, Eliza Edith Barnes, of 76, Tolworth Park Road, Surbiton later 1, Kingsmead Avenue, Worcster Park Road, Surrey. In the 1911 census he was aged 16, born Richmond, Surrey, son of Eliza Edith Barnes (a widow), resident Rosendale, Victoria Park, Andover, Hampshire. In the 1901 censsu he was listed as Ernest G Barnes, aged 6, born Richmond, Surrey, resident with his aunt, Ellen Barnes, at 62, Oxford Avenue, Southampton, Southampton St Mary, Hampshire. Attested 30 November 1915 at Kingston-Upon-Thames, aged 20 years 8 months. Resident 76, Tolworth Park Road, Surbiton, civil occupation Clerk (S.W. Railway), unmarried,height 5 feet 11¾ inches, weight 147 lbs, chest 36½ inches. To Army Reserve 1 December 1915, mobilized 12 December 1916, posted Household Battalion 26 March 1917. Embarked Southampton 26 March 1917, disemabrked Havre 27 March 1917. Employed as Clerk in Engineers Department at Waterloo. No known grave. Commemorated on ARRAS MEMORIAL, Pas de Calais, France. Bay 1. Note: The Household Battalion was formed at Knightsbridge Barracks on 1 September 1916 as an infantry battalion with personnel from the Household Cavalry Reserve Regiments; on 9 November 1916 they went to France and were assigned on 17 November 1916 to the 10th Brigade, 4th Division. On 10 February 1918 they were disbanded in France sending drafts to Household Cavalry and Foot Guards. Private. Employed as Labourer in Engineers Department at Waterloo. Private 13162, 8th Battalion, Princess Charlotte of Wales's (Royal Berkshire Regiment). Killed in action 28 December 1915. Aged 19. Born and resident Windsor, enlisted Reading. Son of Richard and Elizabeth Bartlett, of 11, Duke Street, Windsor. Birth register in the Janaury to March Quarter 1894 in Windsor Registration District, Berkshire; mothers maiden name 'Oakley'. Employed as Office Porter in Traffic Department at Windsor. Joined the National Union of Railwaymen 29 January 1914 as an Office Porter in the Windsor Branch. Buried in MAZINGARBE COMMUNAL CEMETERY, Pas de Calais, France. Grave 44. Private 203966, 1st/4th (T.F.) Battalion, Duke of Edinburgh's (Wiltshire Regiment) formerly 240210, Hampshire Regiment. Killed in action in Egypt 19 September 1918. Aged 28. Resident and enlisted Southampton. Husband of Margaret Emma (nee Cassell) Barton, of 3, Argyle Rd., Southampton, married October to December Quarter 1906 in the Southampton Registrationm District, Hampshire. In the 1901 census he was aged 13, born Southampton, Hampshire, son of John and Maria Barton, resident 115, St Marys Road, Southampton, Southampton St Mary, Hampshire. In the 1911 census he was aged 23, born Southampton, a Labourer at a Coppers, married to Margaret, resident with his cousin at 3 Argyle Road Southampton, St Mary, Hampshire. Employed as Permanent Way Labourer in Docks and Marine Department at Southampton. No known grave. Commemorated on JERUSALEM MEMORIAL, Israel and Palestine (including Gaza). Panel 42. Gunner 170365, 193rd Siege Battery, Royal Garrison Artillery. Died from cerebro spinal menigistis 23 January 1919. Aged 33. Born Amport, Hampshire, resident Southampton, Hampshire. Son of William and Jane Batchelor; husband of Winifred (nee Purdey) Batchelor, of 9, Rockstone Place, Southampton formerly of Violet Cottage, 47, Ashtree Road, Bitterne Park, Southampton, married at Sway 18 November 1915. Employed as Checker in Goods Department at Southampton. Attested 7 December 1915 at Southampton, aged 30 years, resident 60, Priory Road, St Denys, Southampton, civil occupation Railway Checker (L & S W Railway), married, height 5 feet 7¼ inches, weight 154 lbs, chest 36 inches. Buried in AUBERCHICOURT BRITISH CEMETERY, Nord, France. Plot I. Row AA. Grave 8. Private 1849, 7th Battalion, East Surrey Regiment. Killed in action 30 November 1917. Born Wimborne, Dorset, resident New Malden, Surrey, enlisted Kingston-On-Thames, Surrey. Employed as Carman in Traffic Department at Kingston. No known grave. Commemorated on CAMBRAI MEMORIAL, LOUVERVAL, Nord, France. Panel 6. Private 17076, 12th Battalion, Lancashire Fusiliers. Killed in action 14th September 1916 in Salonika. Born 27 January 1897, and enlisted, Wimbledeon, Surrey. Employed as Number Taker in the Goods Department at Nine Elms. Birth registered in the January to March Quarter 1897 in Wandswoth Registration District, London; mother's surname 'Parmiter'. Educated Merton Church of England School (boys), Merton, Surrey, admitted 8 June 1904, left 21 September 1906 for a new school, son of John Charles Batho, resident Sidney Road, Merton. In the 1911 census he was aged 15, born London, an Errand Boy, son of John Charles and Nellie Batho, resident 7, Harcourt Road, Wimbledon, Surrey. Attested 31 August 1914 at Wimbledeon, Surrey, aged 19 years 3 months, a Porter by trade. Height 5ft 4½ inches, weight 111 pounds, chest 34½ inches, hazel eyes, mid brown hair, dark complexion. Commemorated on the DOIRAN MEMORIAL, Greece. Private 42330, 1st Battalion, Royal Inniskilling Fusiliers, formerly 257927, Army Service Corps. Died of wounds 21st November 1917 in France & Flanders. Born South Lambeth, Surrey, 1 December 1896, enlisted Battersea, Middlesex. Birth registered in the March to June Quarter 1883 in the Lambeth Registration District, London; mother's maiden name 'Damen'. In the 1901 census he was aged 17, an Assistant in a Grocers, son of William and Emily Batt , resident 182, Wandsworth Road, Lambeth, London & Surrey. In the 1911 census he was aged 27, born South Lambeth, London, a Shop Assistant in a Grocers, son of William Batt (a widower), resident 166, Wandsworth Road S W, Lambeth, London & Surrey. Educated Putney St Mary's School (boys), Putney, Surrey, admitted 3 May 1910, left 25 November 1910 of age, son of William Batt, of 9 Bigg's Row, Putney, previously attend Parkwalk School, Chelsea. Employed as Labourer in Engineers Department at Waterloo. Buried in GOUZEAUCOURT NEW BRITISH CEMETERY, Nord, France. Plot III. Row A. Grave 9. Corporal. Employed as Labourer in Carriage and Wagon Department at Eastleigh. Acting Sergeant 554027, 511th Field Company, Royal Engineers. Died of wounds 21 September 1917 in France & Flanders. Aged 35. Enlisted Victoria Park, Middlesex, resident Merton, Surrey. Son of John and Louisa Bayles; husband of Nellie Bayles, of 4, Watery Lane, Merton Park, London. Awarded the Military Medal (M.M.). In the 1891 census he was aged 9, born Surrey, a scholar, son of John and Lousia Bayles, resident Tyneham Road, Battersea, Wandsworth, London & Surrey. In the 1901 census he was aged 19, born London, a Joiner (Wood), son of John and Louisa Bayles, resident 59, Tyneham Road, Battersea, Wandsworth, London & Surrey. In the 1911 census he was aged 29, born Battersea, Surrey, a Carpenter, married to Nellie with a son and daughter, resident 20 Shelton Road Merton Park S.W., Merton, Surrey & London. Employed as Carpenter in Engineers Department at Wimbledon. Buried in DOZINGHEM MILITARY CEMETERY, West-Vlaanderen, Belgium. Plot V. Row D. Grave 22. Private. Employed as Clerk in Goods Department at Nine Elms. Acting Lance Corporal 510388, 58th Signal Company Royal Engineers. Killed in action 15 May 1917. Born Wonford, Devon 3 May 1880. Enlisted Exter. Birth registered in the April to June Quarter 1880 in Exeter Registration District, Devon. Educated Exeter, Rack Street Central School, admitted 7 November 1887, left 14 April 1890, son of John C Bealey, resident Friernhay Street, Exeter, previously educated at Dame's School. Educated Exeter Episcopal School, Devon, admitted 24 March 1890, left 19 December 1893 to start work, son of John Bealey. In the 1881 census he was under one year of age, son of John C and Maria R Bealey, resident 22, Friernhay Street, Exeter St Olave, Exeter, Devon. In the 1891 census he was aged 10, born Devon, a scholar, son of John C and Sarah C Bealey, resident Shooting Marsh Stile, St Thomas the Apostle, St Thomas, Devon. In the 1911 census he was aged 30, born Exeter, Devon, a Water Fitter L S W Railway, married to Daisy with one sonm and one daughter, resident 14 Morgans Buildings, Wonford, Heavitree, Devon. It appears that his mother died between 1881 and 1891 and his father remarried. Employed as Pipelayer in Engineers Department at Exmouth Junction. Member of the National Union of Railwaymen, Exeter Branch, joined 8 June 1913. No known grave. Commemorated on ARRAS MEMORIAL, Pas de Calais, France. Bay 1. Private. Employed as Platelayer in Engineers Department at Wickham. Private. Employed as Carriage Cleaner in Traffic Department at Clapham Junction. Private. Employed as Shunter in Goods Department at Nine Elms. Private. Employed as Porter in Traffic Department at Staines. Sapper. Employed as Engine Cleaner in Locomotive Department at Eastleigh. Lance Corporal. Employed as Clerk in Goods Department at Nine Elms. Private. Employed as Labourer in Engineers Department at Wimbledon. Sergeant. Employed as Clerk in Docks and Marine Department at Southampton. Private. Employed as Apprentice in Locomotive Department at Eastleigh. Gunner. Employed as Apprentice in Locomotive Department at Eastleigh. Private. Employed as Number Taker in Goods Department at Portsmouth. Private. Employed as Labourer in Engineers Department at Eastleigh. Private. Employed as Shunter in Traffic Department at Devonport. Lance Corporal. Employed as Assistant Lineman in Engineers Department at Hook. Private. Employed as Engine Cleaner in Locomotive Department at Strawberry Hill. Private. Employed as Parcel Porter in Traffic Department at Southampton. Sapper. Employed as Horse Lad in Traffic Department at Semley. Corporal. Employed as Porter in Traffic Department at Axminster. Signaller. Employed as Clerk in Traffic Department at Farnborough. Rifleman. Employed as Porter in Traffic Department at Waterloo. Lance Corporal. Employed as Shunter in Traffic Department at Chertsey. Private. Employed as Porter in Traffic Department at Esher. Gunner. Employed as Clerk in Goods Department at Nine Elms. Private. Employed as Engine Cleaner in Locomotive Department at Eastleigh. [Listed as Alfred Eustace on memorial, St Paul's Book and CWGC state Eustace Alfred] [Able] Leading Seaman 162467, H.M. "Kerry Range", Royal Navy. Drowned 30 October 1917. Born St Giles, Middlesex 18 February 1876. Husband of Lily (nee Bright) Bromley, of 'Ferndale', 26 Propect Park, Exeter, Devon, married 19 April 1908 st St. Sidell's Church, Exeter, Devon. In the 1891 census he was aged 16, born London, Middlesex, a Domestic Under Gardener, son of Walter and Mary Bromly, resident Dawlish Street, East Teignmouth, Newton Abbot, Devon. In the 1901 census he was aged 25, unmarried, born St. Gioles, London, Middlesex, a Leading Seaman, berthed abord 'Hyacinth' at Devonport, Stoke Damerel, Devon. In the 1911 census he was aged 36, born St. Giles, Middlesex, a Railway Labourer, married to Lily with one son and one daughter, resident 13, Poltimore Terrace, Poltimore Square, Longbrook Street, Exeter, Devon. Employed as Labourer in Engineers Department at Exeter. Member of National Union of Railwaymen as a Labourer, in the Exeter, Devon, Branch, joined 1914. Buried in BALTIMORE (OAK LAWN) CEMETERY, Maryland, USA. Grave 254. Stoker 1st Class K/24902, H.M.S. Raglan, Royal Navy. Died when his ship was sunk during the Battle of Imbros 20 January 1918. Aged 27. Born Barnes, London, 4 October 1891. Son of Edward and Martha Brown, of 17 Railway St., Barnes, Surrey. In the 1901 census he was aged 9, botrn Barnes, Surrey, son of Edward and Martha Brown, resident 59, Railway Street, Barnes, Richmond upon Thames, Surrey. In the 1911 census he was aged 19, a Furniture Porter, born Barnes, Surrey, son of Edward and Martha Brown, resident 17 Railway Street, Barnes, Surrey. Employed as Carriage Cleaner in Traffic Department at Clapham Junction. Member of the National Union of Railwaymen as a carriage Cleaner in Clapham Junction Branch, joined 29 May 1914. Enlisted 12 March 1915 for the duration of the hostilities, civil occupation Railway carriage Cleaner, height 5 feet 8 inches, chest 36&frac12; inches, brown hair, blue eyes, fresh complexion. No known grave. Commemorated on PLYMOUTH NAVAL MEMORIAL, Devon. Panel 29. Private. Employed as Carpenter in Engineers Department at Eastleigh. Private. Employed as Despatch Porter in Traffic Department at Waterloo. Private. Employed as Carman in Goods Department at Nine Elms. Private. Employed as Labourer in Carriage and Wagon Department at Eastleigh. Sergeant. Employed as Clerk in Estate Department at Waterloo. Sergeant. Employed as Labourer in Locomotive Department at Eastleigh. Private. Employed as Platelayer in Engineers Department at Aldershot. Private. Employed as Goods Porter in Traffic Department at Exeter. Driver. Employed as Engine Cleaner in Locomotive Department at Exmouth Junction. Private. Employed as Porter & Relief Signalman in Traffic Department at Hounslow. Private. Employed as Platelayer in Engineering Department at Chard Junction. Private CH/7630, Royal Naval Division, Royal Marine Light Infantry. Killed or died as a direct result of enemy action 20 October 1914. Aged 40. Born Lambeth, London 20 October 1874. Son of William and Caroline Elizabeth (nee Lawford) Cameron; husband of Emma (Emily) Cameron, of 53, Atheldene Rd., Garrett Lane, Earlsfield, London. In the 1881 census he was aged 7, born Lambeth, Surrey, a scholar, son of Caroline Cameron (a widow), resident 8, Clarence Place, Lambeth, London & Surrey. In the 1911 census he was aged 36, born Lambeth, London, a Railway Porter, married to Emily with three sons, resident 58 Tate Street, Kennington S.E., Lambeth, London & Surrey. Employed as Ground Pointsman in Goods Department at Nine Elms. Buried in LAMBETH CEMETERY, London. Plot A. Row 3. Grave 1773. Private 21645, 9th Supernumerary Company, Hampshire Regiment. Died in hospital in the United Kingdom 20 November 1915. Aged 50. Born Woolwich, London and Kent.Son of John and Ella Emma Casson. Served in the Burma War and in the South African Campaign with Royal Field Artillery. In the 1871 census he was aged 4, born Kent, son of John and Eleanor Casson, resident New Cross Road, St Paul, Greenwich, London & Kent. In the 1911 census he was aged 43, born Woolwich, Kent, a Wood Sawyer with LSW, boarding at 87, The Crescent, Eastleigh, Hampshire. In the 1901 census he was aged 34, born Woolwich, Kent, a Domestic Groom, son of Eleanor Casson (a widow), resident 6, High Road Alderley Terrace, South Stoneham, Hampshire. Employed as Sawyer in Carriage and Wagon Department at Eastleigh. Buried in NETLEY MILITARY CEMETERY, Hampshire. C.E. Grave 1754. [Not listed in St Paul’s Cathedral Service Book]. Private G/17134, 13th Battalion, Royal Sussex Regiment. Killed in action 27 September 1917. Aged 19. Born Ilfracombe, Devon, 18 August 1898, enlisted Devizes, Wiltshire. Son of Edgar George and Ellen Elizabeth Challacombe, of 22, Belmont Rd., Ilfracombe, Devon. Baptised 25 September 1898 in Ilfracombe, son of Edgar George and Ellen Elizabeth Challacombe. In the 1901 census he was aged 2, born Ilfracombe, Devon, son of Edgar G and Ellen Elizabeth Challacombe, resident 27, Marlborough Road, Ilfracombe, Barnstaple, Devon. In the 1911 census he was aged 13, born Ilfracombe, Devon, at school, son of George and Elizabeth Challacombe, resident 22 Belmont Road, Ilfracombe, Devon. No known grave. Commemorated on TYNE COT MEMORIAL, West-Vlaanderen, Belgium. Panel 86 to 88. Air Mechanic 2nd Class F/9435, Royal Naval Kite Balloon Station, Felixstowe, Royal Naval Air Service. Killed in action in an enemy air raid on Felixstowe; those killed were Air Mechanic 1st Class A Austins, Air Mechanic 2nd Class J Cordell and Air Mechanic 1st Class A J Huggett 4 July 1917. Son of Henry Cordell, of 26 Dutton Lane, Eastleigh, Hamphsire. Employed as Apprentice. Buried in EASTLEIGH CEMETERY, Hampshire. Plot/Row/Section A. Grave 496. Private PLY/682(S), Plymouth Battalion, Royal Naval Division, Royal Marine Light InfantryKilled in action 10 June 1915. Aged 18. Born St Matthews, Exeter, Devon 24 July 1895. Son of Luke and Ellen Crump, of 28, Clifton Road, Newtown, Exeter. In the 1901 census he was aged 3, born Exeter, Devon. Son of Luke and Ellen Crump, resident 46, Clifton Street, Exeter, Devon. In the 1911 census he was aged 13, born Exeter, Devon, at school. Son of Luke and Ellen Crump, resident 28 Clifton Road, Exeter, Devon. Enlisted Exeter 21 November 1914, engine cleaner by trade, religious denomination Church of England, height 5 feet 7 inches, fresh complexion, brown eyes, dark brown hair. Employed as Engine Cleaner in Locomotive Department at Exeter. No known grave. Commemorated on HELLES MEMORIAL,Turkey (including Gallipoli). Panel 2 to 7. [Not listed in St Paul’s Cathedral Service Book]. Driver T2/016662, 33rd Division Transport, Royal Army Service Corps. Died at 5th Stationary Hospital, Dietotoe, France, of broncho pneumonia 5 March 1919. Aged 22. Born Parkstone, Dorset. Son of Alfred Hubert and Elizabeth Dacombe, of Victoria Rd., Ferndown, Dorset. Son of Alfred Hubert and Elizabeth Dacombe, of Victoria Rd., Ferndown, Dorset. In the 1901 census he was aged 4, born Dorset, son of Alfred H and Elizabeth Dacombe, resident Glenthorne, Alexandra Road, Parkstone, Poole, Dorset. In the 1911 census he was aged 14, born Upper Parkstone, Dorset, Carrying Bricks for bricklayer, resident Victoria Road, Ferndown, Wimborne, Hampreston, Dorset. Engine Cleaner. Attested 5 September 1914 in Southampton. Unmarried, aged 19 years 4 days, born Parkstone, Dorset. Height 5 feet 3¼ inches, weight 136 lbs, chest 35 inches, fresh complexion, grey eyes, brown hair, religious denomination Congregationalist. Buried in JANVAL CEMETERY, DIEPPE, Seine-Maritime, France. Plot II. Row L. Grave 2. Staff Sergeant Major T2/016653, Mehcanical Transport, Royal Army Service Corps attached to 39th Field Ambulance, Royal Army Medical Corps. Admitted to hospital 5 February 1917, died on service in Egypt from abcess of the liver at 19 General (Deaconess) Hospital, Alexandria at 20:20 after an operation 8 February 1917. Aged 27. Born, resident and enlisted Andover. Son of Charles and Ellen (died 8 March 1918) Dawkes, of 19, Anton Terrace, South Street, Andover, Hampshire. Next of kin Wilfred Lawson Dawkes, brother, of 27, Old Winton Road, Andover. In the 1911 census he was born Andover, Hampshire, a Goods Porter, son of Harriet Ellen Dawkes (a widow), resident 14 East Street, Andover, Hampshire. Employed as Goods Porter in Traffic Department at Andover Junction. Attested 1 September 1914 at Andover, aged 24 years 104 days, civil occupation Railway Porter, born in Andover, unmarried. Joined unit 2 September 1914 at Aldershot, appointed Lance Corporal 14 September 1914, promoted Corporal 11 October 1914, promoted Sergeant 26 October 1914. Height 5 feet 6&frac34; inches, weight 137&frac12; lbs, chest 36 inches, fresh complexion, blue eyes, brown hair, religious denomination Wesleyan (Methodist). Attested 1 September 1914 at Andover, aged 24 years 104 days, civil occupation Railway Porter, born in Andover, unmarried. Joined unit 2 September 1914 at Aldershot, appointed Lance Corporal 14 September 1914, promoted Corporal 11 October 1914, promoted Sergeant 26 October 1914. Height 5 feet 6¾ inches, weight 137½ lbs, chest 36 inches, fresh complexion, blue eyes, brown hair, religious denomination Wesleyan (Methodist). Buried in ALEXANDRIA (HADRA) WAR MEMORIAL CEMETERY, Egypt. Plot/Row/Section A. Grave 26. Private. Employed as Engine Cleaner. No further information currently available. [Not listed in St Paul’s Cathedral Service Book]. Sergeant 1838, 9th Battalion, East Surrey Regiment. Employed as Not Known. Died 9th January 1919. Aged 24. Born and enlisted New Malden, Surrey. Son of Tom and Ruth Disbrow, of 29, Northcote Rd., New Malden, Surrey. Buried in LES BARAQUES MILITARY CEMETERY, SANGATTE, Pas de Calais, France. Plot VII. Row E. Grave 8. Private 31188, 8th Battalion, East Surrey Regiment. Employed as Vanguard. Killed in action 3rd May 1917. Born Lambeth, Surrey, enlisted Kington on Thames, Surrey. No known grave. Commemorated on ARRAS MEMORIAL, Pas de Calais, France. Bay 6. Gunner 273335, 3rd Reserve Brigade, Royal Field Artillery. Employed as Fireman. Died in United Kingdom 30th September 1918. Aged 19. Born Heavitree, Devon, enlisted Exeter. Son of Jesse and Mary Dorey, of 8, Bonnington Grove, Heavitree, Exeter. Buried in EXETER HIGHER CEMETERY, Exeter, Devon. Grave 99. Air Mechanic 3rd Class (Rigger - Aero) 98378, 65 Squadron, Royal Air Force. Died, rupture cebral abcess 25 August 1918. Employed as Clerk in Traffic Department at Waterloo. Enlisted 8 October 1917 for the duration of the war. Native of Hammersmith, London. In the 1911 census he was aged 25, born newport, isle of Wight, a Railway Clerk, son of Edmund and Kate Dyson, resident 17 the Grove, Hammersmith, London & Middlesex. Buried in LES BARAQUES MILITARY CEMETERY, SANGATTE, Pas de Calais, France. Plot IV. Row F. Grave 10A. Lieutenant, 5th Battalion, Oxfordshire and Buckinghamshire Light Infantry. Killed in action 1 April 1918. Aged 23. Son of George Hepburn Edwards and Emily Maude Edwards, of 38, Hillersdon Avenue, Barnes, London. Formerly Hampshire Fortress Company, Royal Engineers. Went to France as a Corporal in January, 1915. He was gazetted in March, 1915. in the 1901 census he was aged 6, born Southampton, Hampshire, son of George H and Emily M Edwards, resident Shirley, Goddington Road, Strood Intra, Strood, Kent. Employed in Locomotive Department at Eastleigh. No known grave. POZIERES MEMORIAL, Somme, France. Panel 50 and 51. Sub-Lieutenant, Nelson Battalion, Royal Naval Division, Royal Naval Volunteer Reserve. Died of wounds 5 June 1915. Aged 23. Born 3 September 1892. Son of John Warden and Eliza Edwards, of 6, Knight's Park, Kingston-on-Thames. In the 1911 census he was aged 18, born Kingston, Surrey, an Apprentice Locomotive Engineer, boarding at Chickenhall Farm, Eastleigh, Hampshire. In the 1901 census he was aged 8, born Kingston on Thames, Surrey, son of JOhn and Eliza Edwards, resident 41, Eden Street, Kingston on Thames, Surrey.Employed as Draughtsman in Locomotive Department at Eastleigh. Enlisted 14 August 1914, height 5 feet 9½ inches, brown hair, hazel eyes. Buried in SKEW BRIDGE CEMETERY, Turkey (including Gallipoli). Plot III. Row C. Grave 14. Rifleman. Employed as Parcel Porter in Traffic Department at Bournemouth. Private CH/2362(S), 1st Royal Marine Battalion, Royal Naval Division, Royal Marine Light Infantry. Killed in action 26 October 1917. Aged 19. Born 15 November 1897. Son of Mrs. Mary Daisy Dampier (formerly Mary Fox), of "Horsington," East Oakley, Basingstoke, Hants Enlisted 14 May 1917, aged 18 years 1 month, civil trade Engine Cleaner, religious denomination Church of England. Height 5 feet 11½ inches. Employed as Engine Cleaner in Locomotive Department at Basingstoke. No known grave. Commemorated on TYNE COT MEMORIAL, West-Vlaanderen, Belgium. Panel 1 and 162A. Private. Employed as Porter in Traffic Department at Earlsfield. Assistant Engineer, H.M.S. Sarnia, Mercantile Marine Reserve. Died 12th September 1918. Employed as Assistant Engineer No known grave. Commemorated on PLYMOUTH NAVAL MEMORIAL, Devon. Panel 30. Second Lieutenant, 4th Company, Machine Gun Corps (Infantry). Employed as Clerk. Killed in action 28th March 1918. No known grave. Commemorated on ARRAS MEMORIAL, Pas de Calais, France. Bay 10. Able Seaman 197837, H.M.S. Banyano, Royal Navy. (RFR/PO/B/5845). Died 11th March 1915. Aged 35. Employed as Crane Driver. Son of Mr. and Mrs. Henry Knight, of 8, Lion St., Shirley, Southampton; husband of Daisy Florence Pearce (formerly Knight), of 78, Millbrook Rd., Southampton. No known grave. Commemorated on PORTSMOUTH NAVAL MEMORIAL, Hampshire. Panel 7. Steward, H.M.S. Sarnia, Mercantile Marine Reserve. Employed as Chief Steward. Died 8th September 1916. Aged 40. Husband of Edith Le Huquet, of 13, Newcombe Rd., Southampton. Buried in EAST MUDROS MILITARY CEMETERY, Lemnos, Greece. Plot III. Row F. Grave 182. Air Mechanic 2nd Class 43584, Royal Flying Corps attached 6th Siege Battery, Royal Garrison Artillery. Employed as Clerk. Killed in action 31st July 1917. Buried in CITE BONJEAN MILITARY CEMETERY, ARMENTIERES, Nord, France. Plot VIII. Row D. Grave 22. Lieutenant, Royal Munster Rifles attached 6th Battalion, Connaught Rangers. Employed as Booking Clerk. Died 3rd July 1917. Aged 35. Son of Thomas Arthur and Martha Jane Male; husband of Alice Maud Beer (formerly Male), of 36, Albany Rd., New Malden, Surrey. Native of Esher, Surrey. Buried in LONGUENESSE (ST. OMER) SOUVENIR CEMETERY, Pas de Calais, France. Plot IV. Row C. Grave 46. Captain, 1st Battalion, Royal Dublin Fusiliers. Died 1st July 1916. Son of Maj. John Drought Maunsell and Euphemia Sullivan Maunsell (nee Bush), of Taunton, Somerset. Employed as Assistant Foreman. Buried in AUCHONVILLERS MILITARY CEMETERY, Somme, France. Plot I. Row A. Grave 11. [Memorial states Corporal]. Driver T/28938, No. 3 Company, 2nd Division Training Battalion, Royal Army Service Corps. Died 7th May 1915. Aged 21. Son of Sarah Moran and the late John Moran. His brother John also fell. Employed as Striker. Awarded the R St G. and the Distinguished Conduct Medal (DCM). Buried in EASTLEIGH CEMETERY, Eastleigh, Hampshire. Plot A. Grave 880. Private 87796, 13th Battalion, The King's (Liverpool Regiment). Died 27th September 1918. Aged 29. Employed as Dynamo Examiner. Son of E. J. and Mary Ann Moy, of 7, Arragon Rd., Twickenham, Middx. Buried in GRAND RAVINE BRITISH CEMETERY, HAVRINCOURT, Pas de Calais, France. Row A. Grave 47. Private 39824, 1st Garrison Battalion, Somerset Light Infantry. Died 6th November 1918. Aged 28. Employed as Porter. Son of John and Kate Munday, of Eastney, Portsmouth. No known grave. Commemorated on KARACHI 1914-1918 WAR MEMORIAL, Pakistan. Stoker 1st Class SS/100131, H.M.S. Alcantara, Royal Navy. Died 29th February 1916. Aged 32. Employed as Quarryman. Son of Harry and Harriet Pearse, of 1, East St., Okehampton; husband of Amelia Pearse, of 46, North St., Okehampton, Devon. No known grave. Commemorated on PLYMOUTH NAVAL MEMORIAL, Devon. Panel 16. Second Lieutenant, Royal Air Force. Died 18th July 1918. Aged 18. Employed as Clerk. No known grave. Commemorated on HOLLYBROOK MEMORIAL, SOUTHAMPTON, Hampshire. Gunner 1557, "B" Battery, 235th Brigade, Royal Field Artillery. Died 25th September 1917. Employed as Clerk. Buried in FLATIRON COPSE CEMETERY, MAMETZ, Somme, France. Plot I. Row F. Grave 14. 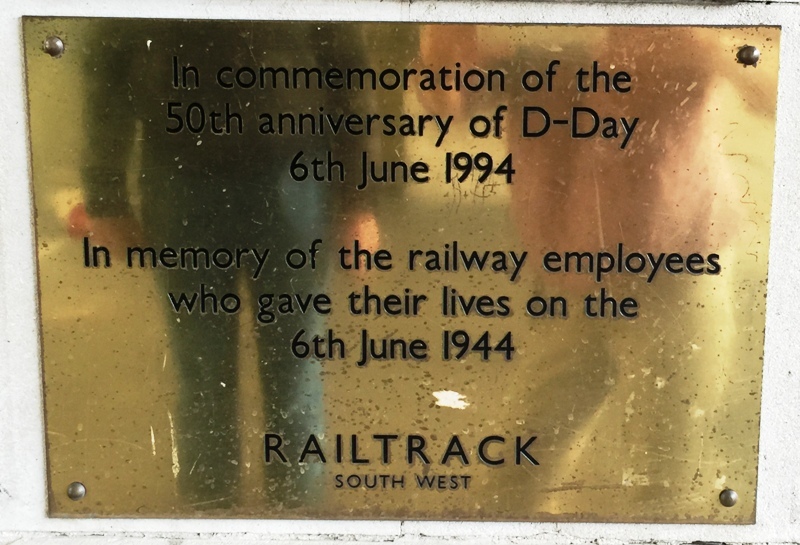 [Listed incorrectly as H PLANT on the memorial but correctly as R PLANT on the L & SWR memorial on Guilford Station.] Corporal 7069, 2nd Battalion, King's Own Yorkshire Light Infantry. Died 18th April 1915. Employed as Platelayer. Buried in OOSTTAVERNE WOOD CEMETERY, Heuvelland, West-Vlaanderen, Belgium. Plot VII. Row J. Grave 10. Also commemorated on Stoke-next-Guildford parish church memorial and the main Guildford memorial in Guildford Castle grounds. Leading Seaman 180776, H.M.S. Pembroke, Royal Navy. Died 23rd July 1917. Husband of G. J. Stacey, of 114, New Rd., Battersea, London. Employed as Crane Examiner. Buried in TOOTING CEMETERY, LAMBETH, London. Screen Wall. W.3. 6. Private 6820, 1st Battalion, Hampshire Regiment. Killed in action on the first day of The Battle of the Somme 1 July 1916. Born Chilbolton 1st March 1885, enlisted Winchester, resident Andover. Son of Harry and Ann Toomer (nee Mansbridge); he had three sisters and two brothers. Harry was married to Amy Scivier on 11 April 1914, and was recalled for the Expeditionary Force in August 1914, went to the front 27 August 1914. He had a daughter born the following January (Dorothy), and a daughter born after his death (Betty). Employed as Platelayer No known grave. Commemorated on THIEPVAL MEMORIAL, Somme, France. Pier and Face 7 C and 7 B. Also listed on the Andover War Memorial. Boy 1st Class J/35734, H.M.S. Swiftsure, Royal Navy. Accidentally killed 30th December 1915. Employed as Engine Cleaner. Born Highbury, London 8 January 1899. Son of Jessie M. Wilkins, of 62, Field Lane, Teddington, Middlesex. Enlisted 8 January 1915 (some records state 1917 after his death) for 12 years, height 5 feet 3 inches, chest 34 inches, brown hair. Grey eyes, fresh complexion, civil occupation Engine Cleaner. Buried in LANCASHIRE LANDING CEMETERY, Turkey. Section K. Grave 54.